A few “Christmas” decorations that feature stars and wisemen still linger in our home as we travel through the season of Epiphany. And while I feel as though I’ve just turned myself to Epiphany, I know it is time to start thinking about Lent. I must admit Lent often sneaks up on me and my Lenten discipline is thought of and started on the same day. As I think ahead to Lent, my first instinct, as one who loves to create, is to pull out my new favorite liturgical cookbook and look through my Lenten Pinterest board asking the question “How can I create spaces that pull us into Lenten disciplines and that help us learn more about Jesus?” But I know that the place I should start is prayer. It is so easy for me to get lost in the making and learning of living out the liturgical year that I can forget that the point is a journey to the heart of God. The point is a relationship. Making and learning are a big part of that journey, but only if it truly leads us closer to God and others. This year, I have three intentions for Lent. First, I long to find more time to pray as a family and on my own. Second, I want our family to journey with Jesus by hearing the story of his life, death and resurrection. And third, I want to build habits that help us love God and others more. As I think forward to Lent this year, I’m most committed to work toward sustained quiet times for myself to reflect and pray. The planning is to simply put this time on the calendar and then the practice is to hold myself to these times of prayer (which isn’t simple at all). 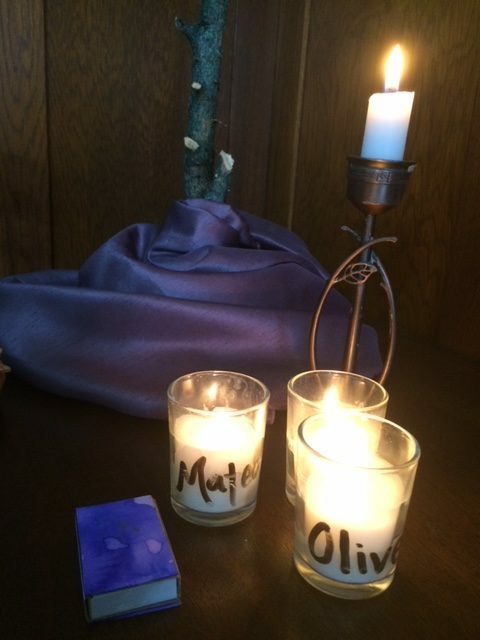 As a family we will have votives with people and places we are praying for on the table to light and pray for each night and I will build a Lenten focal space in our dining room. Hearing about the life of Jesus is always at the heart of our Lenten practices. We do a Jesse tree through Advent and think about Jesus’ birth and who He is through Christmastide and Epiphany. Every year we do daily readings (well, that is at least the goal) that take us through the entirety of Jesus’ life during Lent. 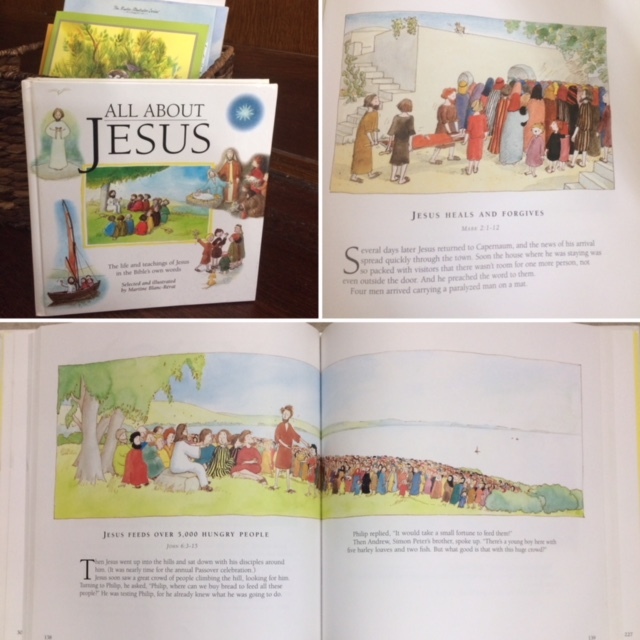 We have read the beautiful All about Jesus Bible together as a family the past few years. It takes passages from all four gospels in the New Living Translation and tells the story of Jesus with beautiful illustrations. I’m looking forward to reading a full gospel as a family in a couple years, but after long school days and due to the young ages of my children All about Jesus is a lovely way for all six of us to encounter scripture in a meaningful, doable, and hopefully enjoyable way each day. After we read the passage for the day, I ask wondering questions. Often it is as simple as “What was your favorite part of the story?” Or “What part do you think is most important?” The wonderful thing about this practice is that aside from finding the Bible we read together and placing it in the ‘read aloud’ basket by the table, there is nothing else to prepare. I have been reflecting a lot lately on the importance of building habits in our lives that help us love God and others. I want to frame our Lenten fasts in this way. More than just giving something up, I want us to cultivate practices that make room to love God and others more. Often that entails giving something up, but I want to be intentional about filling the space the ‘giving up’ leaves in meaningful ways. I’m looking forward to having conversations with my older two boys in the next week and thinking about practices that we can adopt in Lent to help them work on a single habit over the forty days. We will begin these conversations with a discussion of the fruit of the spirit to help us think about the habits we are trying to cultivate. My husband and I have been having similar conversations over the past week as we think about our own hopes for drawing close to God through the season of Lent. 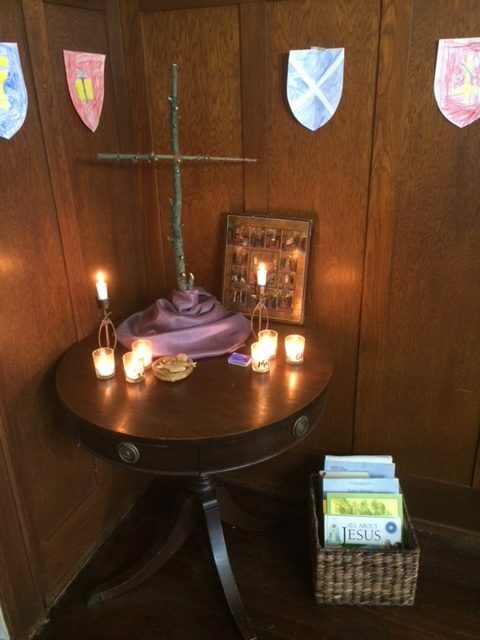 This is the prayer corner in our dining room and read aloud basket. The cross is made from our Christmas tree, which is a yearly tradition. These intentions of prayer, reading the life of Jesus and building habits are certainly nothing novel, but every year they are life giving, even if they are interrupted and at times intermittent. It isn’t that they are done perfectly that seems to shape us, but that we long to do them. We are claiming that knowing Jesus is what we long for and in Lent we build habits to solidify and deepen that longing. How are you thinking ahead to Lent at home?